Do you ever have a busy week where you don’t have time to cook every night, but still want to eat healthy and delicious meals? Well, this is a great, budget-friendly meal that you can cook in bulk and easily store in tupperwear to eat throughout the week. Obviously, feel free to alter this recipe if you want more or less, or don’t care for some of the toppings. You could also skip the tortilla and put over lettuce for a fajita salad. Serves 2, with leftovers for 2-3 days. 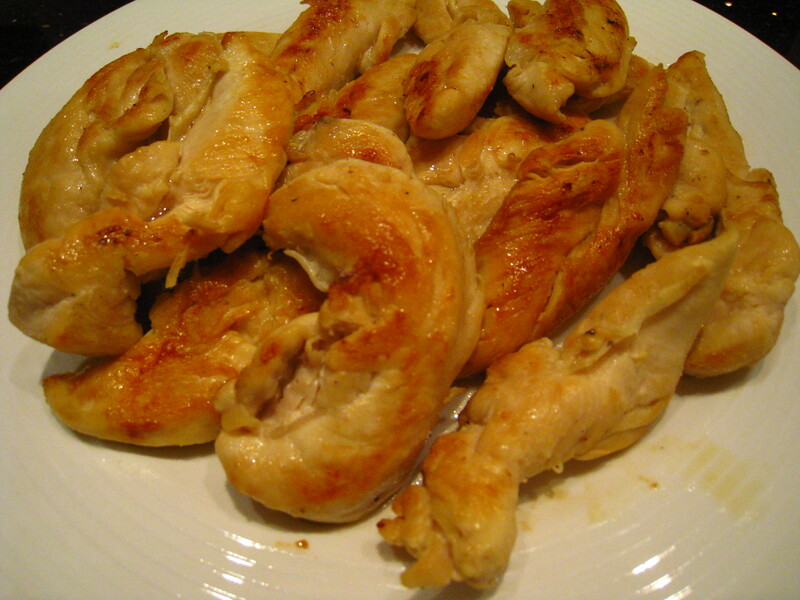 Chicken: Cut the chicken breast into smaller strip-like pieces. Heat 1 tbsp olive oil in a pan and add chicken. Cook the chicken for about ten minutes on medium-high heat until the chicken is browned. Sprinkle the chicken with black pepper and garlic salt to taste. Spicy Salsa: Dice up the bell peppers and onion. In a medium pot, heat 1 tbsp olive oil medium-high heat. Add 1 tbsp of crushed garlic and stir until the garlic turns a toasted color. Then add peppers and onions and sautee for approximately 10 minutes. 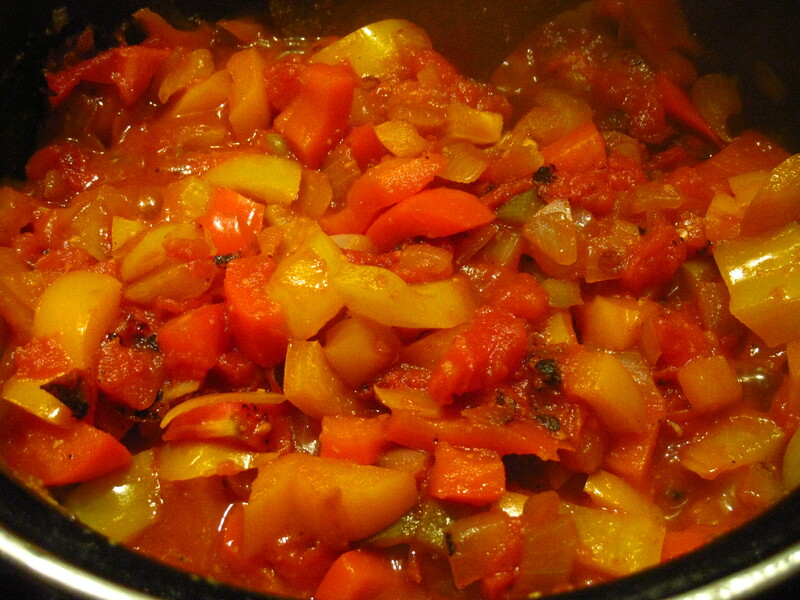 After onions have turned a transulcent color and the peppers have softened, add the can of fire-roasted tomatoes. Turn the heat on low and simmer for 10 minutes. Add hot sauce and sprinkle garlic salt to taste. After the chicken and salsa are cooked, you can put them the tortilla and add any topings and condiments that you’d like. What I do, is first spread 1 tbsp of refried beans and/or sour cream on the tortilla and then I add the chicken and salsa. You can add the mozzarella last so it melts into the toppings. 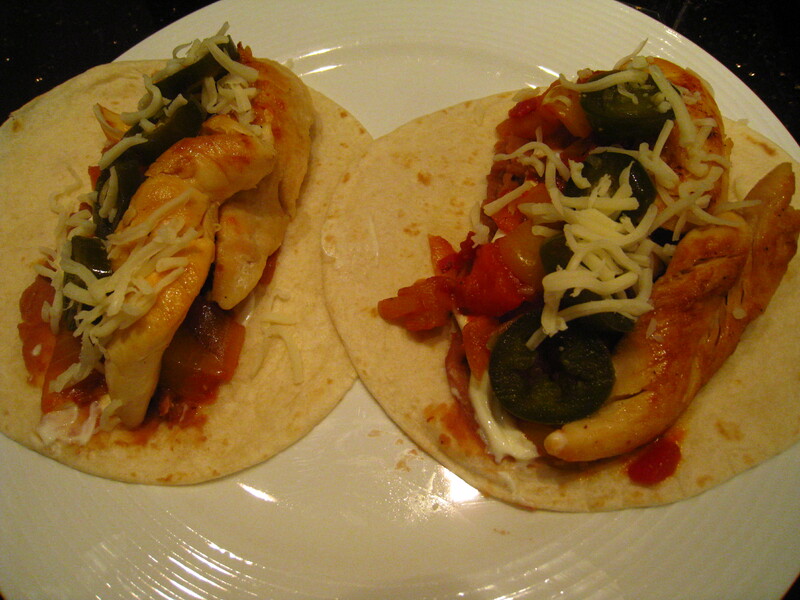 On some fajitas, I may add sliced avocado or jalepenos- you can do whatever your heart desires! After you’re done with your fajitas on night #1, store the chicken and salsa in separate tupperwear in the fridge. 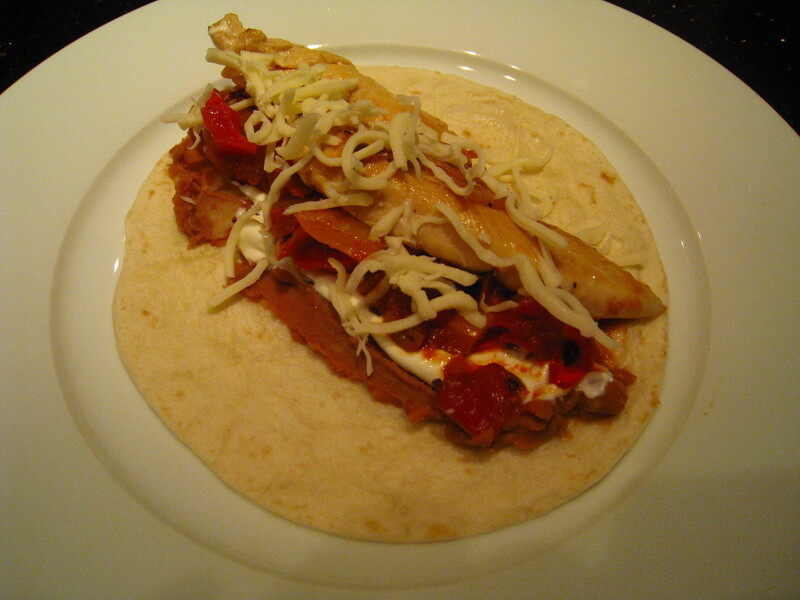 For leftovers, simply heat up the chicken and salsa and make your tortilla. Easy and yummy, night after night! ← The World’s Greatest Olive.